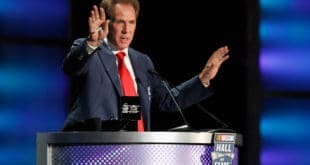 Brad Keselowski hitting on all cylinders to start the summer- Though it may have come by fuel mileage, Keselowski wound up in victory lane again on Saturday evening in Kentucky. It was his third win in six tries at the newly repaved 1.5-mile racetrack. 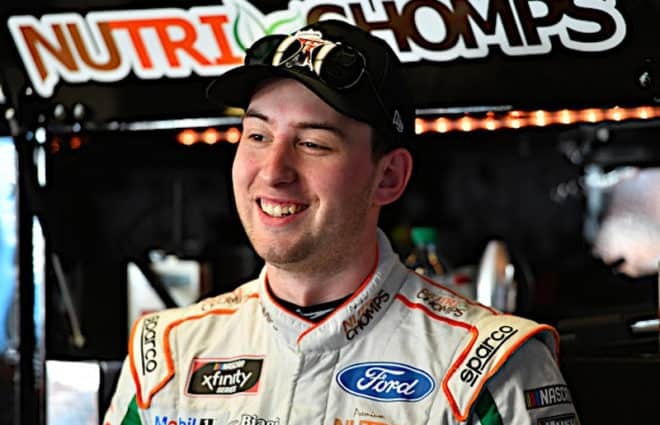 Adding the XFINITY Series, he has won at least one race in six consecutive seasons in the Bluegrass state. The No. 2 car went the final 68 laps on a tank of gas, something only eight other cars could do. However, Keselowski saved gas while leading the majority of the last stint, setting a blistering pace. 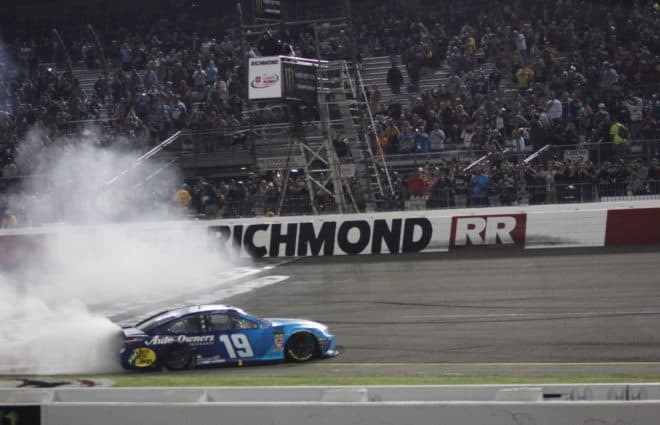 Once Martin Truex, Jr. and Matt Kenseth pitted, Keselowski had over a 10-second lead on Carl Edwards, who made it known he was going trying to go the distance. The No. 19 car got it down to one car-length before the No. 2 car stepped up the pace on. Coming to the white flag, Keselowski believed that he had run his car completely out of gas, until it re-fired. He had just enough gas to get back to the checkered flag before the Ford ran completely out of gas, needing a push by a tow truck to victory circle. Winning the race jumped Keselowski and Team Penske to the top of the Chase standings, as he has a series-high four victories in 2016. As the Cup Series crosses the halfway point of the season, Keselowski is confident heading to the Magic Mile. In the last four races at New Hampshire Motor Speedway, Keselowski has led 321 laps, including a victory in 2014. The 32-year-old is eyeing his third straight triumph, something he’s never done in the Cup Series. He’s only went back-to-back one other time, also in 2014 at Richmond and Chicago. 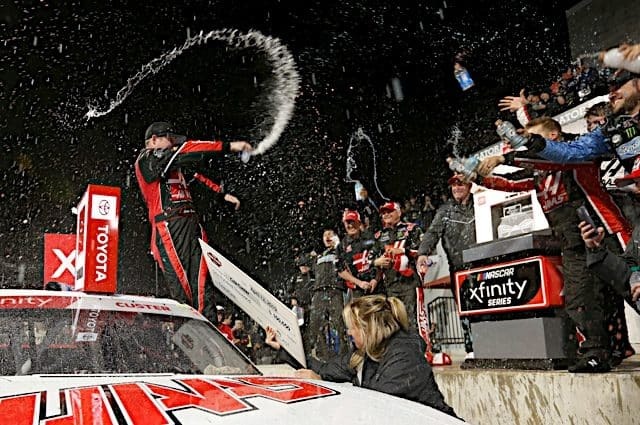 XFINITY: Be Ready for Kentucky Return – Unlike the Sprint Cup Series, NASCAR’s XFINITY Series will make a second stop at Kentucky Speedway later this year. 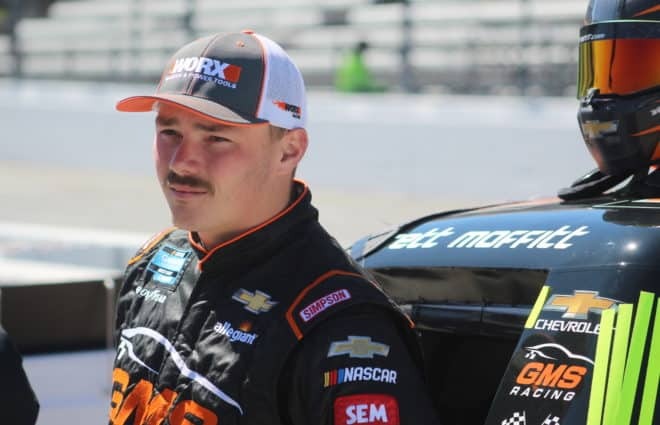 That race will take place on September 24th, and it will serve as the first race of the inaugural NXS Chase. Whatever information teams can glean from this weekend’s race will be important. 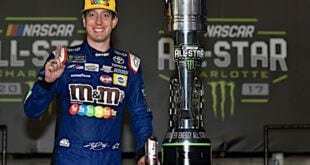 Not only will the Chasers need to start the off the postseason with a good run, but figuring out how to go fast at Kentucky could be crucial for the later races. After all, five of the seven Chase races are on 1.5 mile tracks. 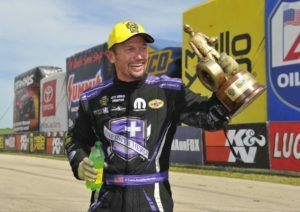 NHRA: Beckman Notches That Elusive Win – Fast Jack Beckman has indeed been fast, qualifying atop or near the top of the standings all season, but actually parlaying those quick qualifying runs into a win has proven difficult. 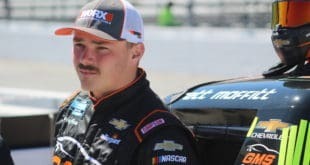 Beckman finally found himself hoisting the Wally at team owner Don Schumacher’s home track in Chicago after winning the K&N Route 66 NHRA Nationals. The Funny Car final came down to Beckman facing off against his Don Schumacher Racing teammate Ron Capps. Beckman’s 3.955 second, 324.05 mph run was good enough to get it done after Capps had troubles around half track and posted a 4.522 second, 194.74 result. Beckman also got by John Hale, Courtney Force, and Robert Hight on his way to the matchup with Capps. DSR also took home the Top Fuel trophy after Antron Brown nabbed the win over J.R. Todd in the finals. It marked the fourth straight year the team has gotten the Nitro sweep at this event. Brown posted a run of 3.777 seconds at 321.19 mph to defeat Todd’s 3.798 seconds at 322.11 mph in an excellent side-by-side battle. Brown got by Clay Millican, Terry McMillen, and Leah Pritchett in earlier rounds. Pro Stock was still all KB Racing in the finals, but with a slightly different look as Greg Anderson faced off against Bo Butner. Butner is still looking for that first win after Anderson’s 6.644 seconds at 209.01 mph beat his 6.667 seconds at 209.17 mph. Chalk that up however as Anderson’s 84th career Pro Stock victory, just one win behind Bob Glidden to tie Glidden for second on the all-time Pro Stock win list. Anderson beat Dave River, Allen Johnson, and Shane Gray in earlier rounds. Gray was the No. 1 qualifier for the event, so it would appear the gap KB Racing has enjoyed over the competition all season could be closing. Formula 1: Hamilton Takes Home Grand Prix – The British Grand Prix started behind the the safety car on a wet track, allowing pole-sitter Lewis Hamilton to avoid the one area where he has struggled this year – the starts. With that aspect out of the way, all that was left to do was handle the changing track conditions, as teams switched from wet intermediate tyres to slicks. Hamilton managed a gap of about six seconds over the second-place drivers throughout the event and cruised home to his third consecutive British Grand Prix win. Mercedes teammate Nico Rosberg took second on track, and was followed by Red Bull’s young phenom Max Verstappen. Rosberg’s finish brought controversy as he took team orders on how to drive his ailing car, violating the the radio rules governing the sport. He endured a 10-second penalty, thus relegating him to third. Hamilton may have been the main story, but Verstappen is continuing to show that he is a talent worth watching, snatching his third podium since moving from Toro Rosso to Red Bull – as he is also outperforming his teammate, Daniel Ricciardo. 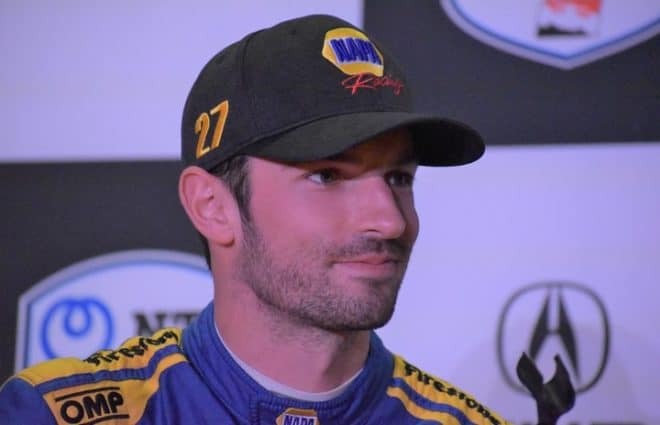 Sports Cars: Balance of Performance is Once Again an Issue – Watkins Glen saw a rather substantial imbalance in performance in a couple of the classes. In GTLM especially, the Fords were all-conquering. Remember, at Le Mans, the two fastest Fords were the Fords that compete in the IMSA WeatherTech SportsCar Championship, not those in the WEC. The duo of Richard Westbrook and Ryan Briscoe won easily while Joey Hand made a late pass on BMW Team RLL’s Bill Auberlen to make it a Ford 1-2. Last week, IMSA made a rare usage of Article 2.2.2 of the IMSA Sporting Regulations, known as the “Principal Rule,” in order to make adjustments inside of seven days prior to a race. This is similar to NASCAR’s rules that effectively allow them to act whenever they see fit on certain issues. However, it is the first time that IMSA has made use of this rule. What changed? The Fords were given 15 extra kilograms of weight (approximately 33 pounds) and a new series of boost ratios for the twin-turbo engine that formerly made its home in Daytona Prototypes. They also had their fuel capacity cut by two liters. The Corvettes were given a ten kilogram (approximately 22 pounds) weight break, a bigger air restrictor and two extra liters of fuel capacity. The Ferrari 488 GTE got one extra liter of fuel capacity and the Porsche 911 RSR got a 10 kilogram weight break. In GT Daytona, the Audi R8 LMS GT3 and the Ferrari 488 GT3 both got 15 kilograms added to the cars, while the Porsche 911 GT3-R’s each got ten kilograms added. What was the result of these changes? The No. 67 Ford won their third straight race in class at Canadian Tire Motorsports Park, but they weren’t all-dominating. Corvette Racing won the class pole and finished 2-3 in the race. The Porsches were in the back during qualifying, but the No. 912 of Earl Bamber and Frédéric Makowiecki were as high as second late before dropping back to sixth. The lone Ferrari was seventh. In GT Daytona, the best Audi was the No. 6 of Robin Liddell and Andrew Davis in second, despite their added weight. The Ferrari 488 GT3 for Scuderia Corsa was fourth, while the No. 23 Alex Job Racing/Team Seattle Porsche was dominant until they lost a left front wheel.